Solid manure is typically generated in systems where bedding is added to manure to absorb moisture and enhance environmental conditions in the production area. Solid manure can also result from drying conditions such as occur on the surface of a beef feedlot. Solid manure storage and handling is typically more forthright than liquid or slurry manure systems. Solid manure is usually collected using scrapers, box scrapers, blades, front-end or skid-steer loaders or similar devices. Equipment sizes range from small blades suitable for tractors of 50 hp or less to large bucket loaders mounted on dedicated power units for operations generating large volumes of manure. Solid manure is typically handled, transferred or transported in box-type vehicles (truck-mounted or pull-type) equipped with drag or apron chains to unload the material. Additionally, some type of fragmentation devices such as beaters, spinner plates or flails are usually employed at the unloading point to chop and spread the manure as it discharges from the vehicle. In some cases, large piston pumps or paddle-type barn cleaners are used to transfer solid manure from a production area to a manure storage area. For more information, visit the Solid Manure Application Equipment page. 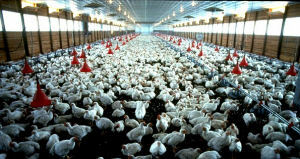 Poultry litter contains bedding to create manure mixture with as much as 50% solids. Solid manure handling equipment should have heavy-duty characteristics and be able to operate in corrosive environments. 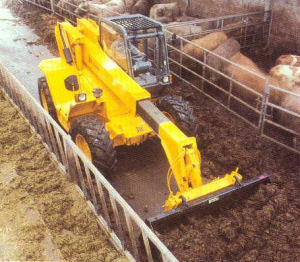 Box-type manure spreaders (left) with flails or beaters can handle manure containing large amounts of bedding. Trucks spreading poultry litter (right) are equipped with spinner plates to spread the manure in a wide swath.